This entry was posted on October 6, 2013 by Tintean Editorial Team/fdg, in Book review, Of Literary Interest, Poetry and tagged family relationships. Bookmark the permalink. 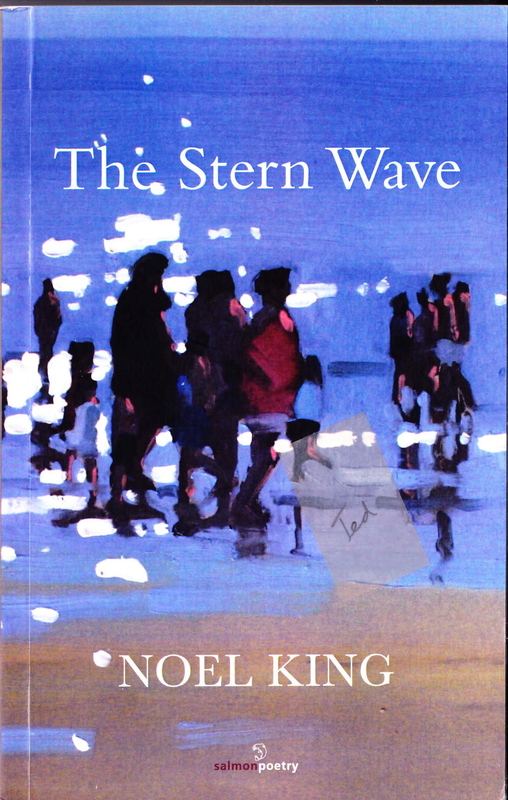 Review: Noel King, 2013, The Stern Wave, Salmon Poetry, Cliffs of Moher Co. Clare. Noel King (b. 1964) lives in Tralee, and is editor of Doghouse Books and Revival Literary Journal, Limerick. This is his second collection of poems, following on from the popular Prophesying the Past (2010), and addresses a range of familial and contemporary subjects, in mixed tones of humour and regret. This trait can be seen in the rather unsettling ‘Cork Christmas Panto, 2047’ where not only does ‘the Dame’ get ‘his comeuppance’, but also ‘the well-to-do families’ whose ‘Global Warmed parked cars’ are drowned under a ten foot surge of the River Lee. It’s a surreal scene worthy of script by Spike Milligan, but frightening all the same because what would happen to the lowlands if the doomsayers’ predictions proved true? There is also a strong pictorial element in these poems, which are not merely quick sketches, but delve deeply into a sense of place, the people and their occupations. The opening poem, ‘Painter’, describes the speaker’s life as ‘a wildlife painter’ who carefully goes about the ‘chore’ of gathering information, ‘sketches, taking photographs, getting wet’, and yet who finds himself setting out to solve the problem of knots. Anyone who has attempted to draw a knot would know how difficult it is to discern the curves and tucks of hempen lines. King lists the many kinds of knots he paints: ‘love knots / strangle knots / … the stern wave / mooring hitch …’ , and so on. But the poem is not so much about knots as such, for they will be displayed and unravelled in the poems following, as a rewriting of Shakespeare’s boast of ‘Sonnet XVIII’ when King asserts, ‘… when I die, when I die,/ these paintings will be hanging, / hanging all over the world’. It remains to be seen if this holds true. Living as he does in Tralee, many of King’s poems show an intimacy with the sea. In the final poem of this collection, ‘The End of the Season’, he clearly depicts the interactions of two generations, the father carefully washing down his boat in preparation for winter storage, ‘ three strokes, / then straightens back up, more water, / strokes and bends back up’. The son, on the other hand, is all rush and blather, ‘smokes and / answers his mobile’, though any possible conflict is resolved by the appearance of a ‘head-scarfed woman’, wife and mother, and the family’s subsequent retreat from the beach. No such reconciliation is made in ‘Island’, which begins with an act of filial rebellion: ‘I steal the charts my father made …’. The drama ensuing is as bitter and deep, going to the core of masculine relationships. The son in ‘guilt night after night’ studies his father’s secrets, wanting to emulate, even surpass his rival, to ‘place my tent … hunt the wildlife’. In the long run, the boy discovers a son cannot be his father, and admiration, when it turns into envy, can only yield disappointment: ‘now that I am ashore’, King writes, ‘the island doesn’t hold much for me anymore’. There are monsters too in this collection: a Mr Buckley who sullies a girl’s communion day, the all-too-perfect daughters of the grand house, ‘Delphine and Christine’, who become one woman’s life-long burden, and other more frightening figures like the mummies who frighten the boy so greatly that he wet his pants, and yet are figures of ridicule when a mummified head becomes a ‘football’ for the ‘gurriers’ who vandalised St. Michan’s Church, Dublin. On the other hand, when writing about the women, King seems more at ease, as in ‘Puzzle’, where he gives an affectionate portrait of his mother’s domestic life, and her engagement in jigsaw puzzles, the ‘dozens of them that might never be made up’, or in writing of his wife in ‘Brides are Supposed to be White’. In portraying anonymous women, ‘afraid of the sea’, there is a touch of courtly affection as they untangle the knots that secure their lives. Both collections are carefully designed and handsomely presented. The writing in both shows the pervasive influence of post-war writing styles, in which rhyme is abandoned in favour of sense, and there’s even the occasional dip into profanity. The poems range from loose, conversational pieces, like ‘Man on a Tractor in County Laois’, to more formally structured poems such as ‘Island’ or ‘A House of Golden Thread’. To say that these poets have been overly influenced by poets such as Seamus Heaney, John Montague, or Ted Hughes, each having addressed a range of similar topics and whose works are integral to contemporary poetic discourse, is to miss the point, for each poet has taken the subject matter at hand and applied his own skilled voice to the page. Edward Reilly, MA PhD, edits the literary journal Azuria for Geelong Writers inc. His poetry has been published here and overseas, as have several articles in Tinteán. He is currently preparing for publication A Wolf At Our Door, a memoir of Siberian exile that has been translated by his wife, Jura, from the Lithuanian of Irena Kazlauskas.